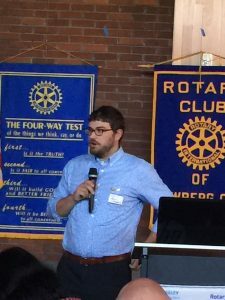 “Bitcoin: How It Works, How To Get It, Should You Care” was the title of last week’s fascinating presentation by Kevin Chambers from the McMinnville Noon Rotary Club. Kevin is with Headwater Investment Consulting, an independent wealth management company. Kevin said the movement toward a digital cash system was originally started by “cypherpunks,” who were into freedom and lack of government regulation. He said Bitcoin specifically was started in 2008 by Satori Nakamoto– and what a story around that guy! Apparently that may not be his real name, he owns a huge amount of Bitcoin, and no one knows where he is now or if he is even alive. Bitcoin is accessed through a “key” system. Your private key is a long (64-digit) random number that provides anonymity and is very secure. Transactions are bundled into a “Blockchain” using cryptography as a tool to verify validity. According to Kevin, the invention of the blockchain for Bitcoin made it the first digital currency to solve the double-spending problem without the need of a trusted authority or a central server. While third parties go against the founding concept of no middleman, you can pay a company for a “Wallet” to remember your 64-digit key for you. You can also use an “Exchange” to buy or sell Bitcoin. “People are willing to invest in Bicoin because they think there will be future value.” he said. “As an investment, you are betting that the price will go up. 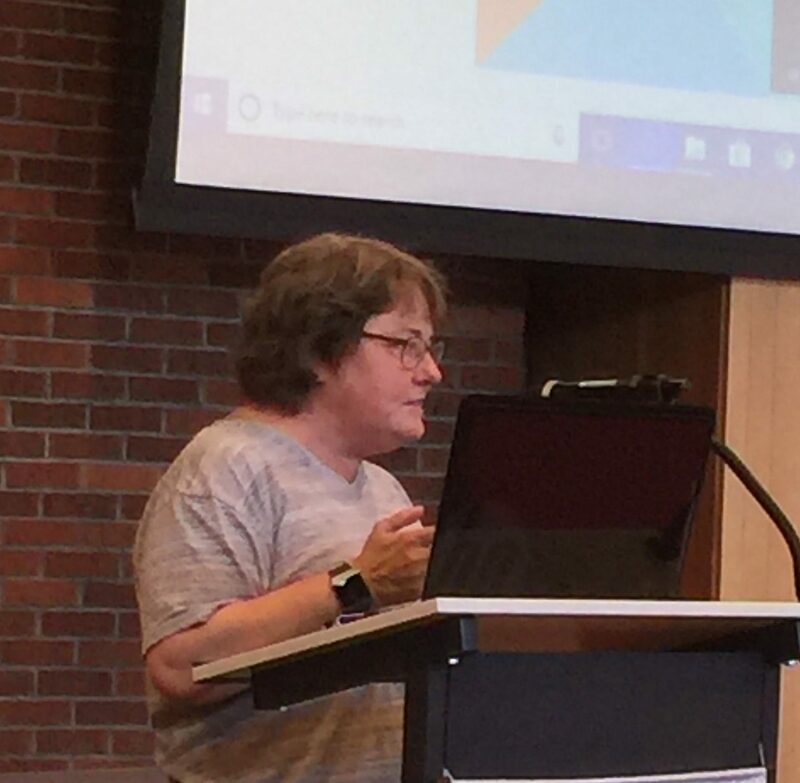 If you want to buy some Bitcoin, but you don’t want to mine, go to an exchange to buy.” Auction Chair Denise Bacon, who was still battling pneumonia, gave us an update on some possible changes in the auction for next year, including the venue. Due to rising costs at the Allison Inn, it is being proposed that the club hold the auction at the Chehalem Cultural Center instead. She said the ballroom (where our club currently meets) could be decorated in such a way as to be very appealing and upscale. She asked for club members with concerns or comments about such a change to email her at: denisebacon@aol.com. PDG Mike Caruso received acknowledgment from our Club for his getting the well-deserved Rotary International Distinguished Service Award for exemplary humanitarian service at the District Conference in Salem. 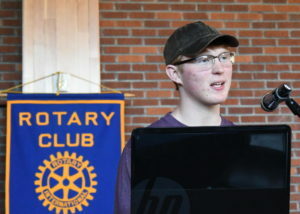 Mike then told us about his recent trip to Lebanon to attend a Rotary conference, and the issues that a small country of 5 million people are having absorbing 1 1/2 million Syrian refugees. In strategizing with the Rotary Club in Tripoli on ways to help, it was decided to try a Peace Village camp, which teaches children conflict prevention and resolution skills. The camp is being scheduled for late Fall in Tripoli, and will utilize club funds normally used to support Peace Village Newberg, which is on hiatus this year. This will be the first international Peace Village. 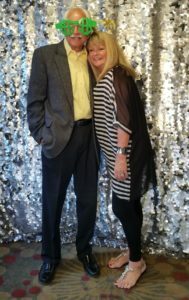 Kim Abraham from Director’s Mortgage joined us for the second week in a row to check out our club. Welcome, Kim! Tommy Sherwood from the McMinnville Club and Headwater attended to support our speaker. Please be sure your calendar is marked and highlighted for Thursday, June 14. That’s the date of our annual Installation Dinner–always a nice affair at Methven Vineyards. 5:30pm – 9pm. Current President Todd Engle will turn over the reins to Om Sukheenai. 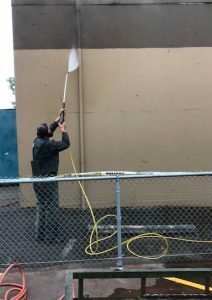 Painting of the club’s Rotary mural on the side of the Steve’s Auto Body building on Highway 99W began last Friday! Our four George Fox student artists are working collectively to design and paint it. Should be done by the end of June. 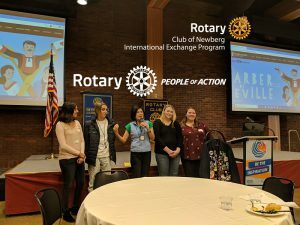 Come hear from Newberg Rotary’s international exchange student from Argentina. See you on Wednesday at the Cultural Center. 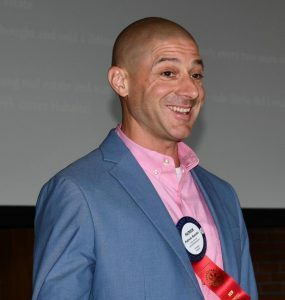 “This will be like drinking from a fire hose.” That’s how our guest speaker last week, Dan Sockle, a Rotarian Peacebuilder from the “Three Creeks” Club in Vancouver, Washington, described his presentation, and he wasn’t kidding! 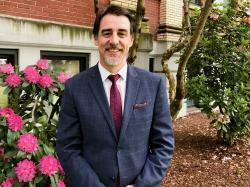 Dan’s goal was to explore what Rotarians can do to build peace by collaborating more within and beyond Rotary. He outlined some of the challenges we face and possible solutions. He had tons of thoughts, ideas, and suggested projects, and discussed them in rapid-fire mode. He touched on “Mediation 101,” and addressing the challenges of hate and divisiveness in our society today. 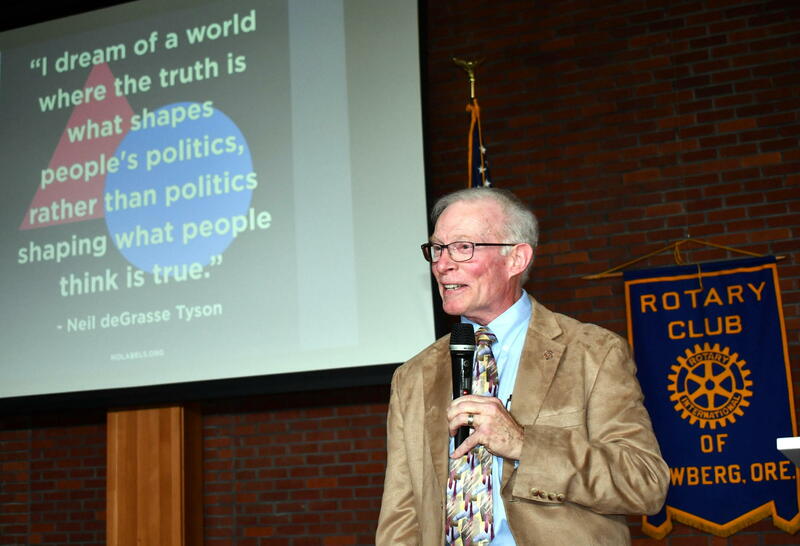 He covered foundational communication skills, like listening, that can help turn the tide on politically and media-driven “tribalism” that has furthered extremism and taken it to new heights. Among the many other ideas: to partner more with those on the “front lines” of conflict: Rotary Peace Fellows, Rotarian veterans, active law enforcement and even chaplains. He advocated sharing the 4-way test beyond Rotary. Increasing a general awareness of real life experiences, bringing more role models, representing various professions and life experiences, into our schools and classrooms. 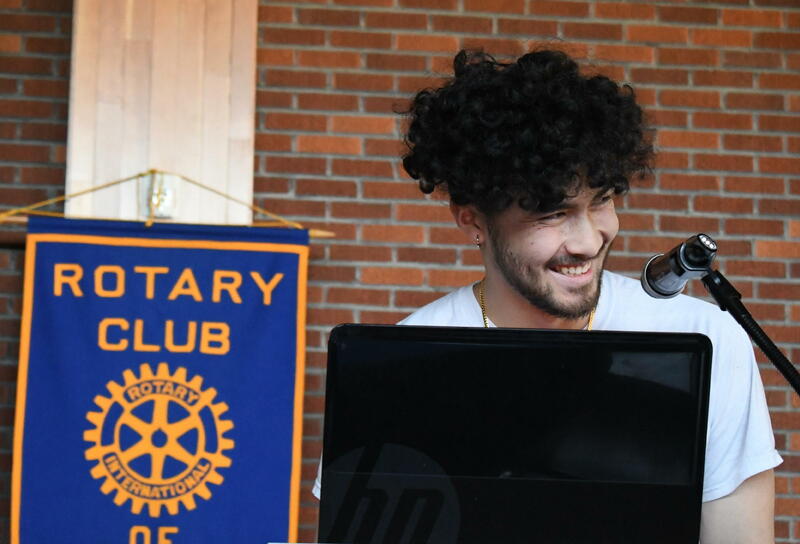 Opportunities to bring a “value-added” to Interact and comparable school clubs (like Kiwanis’ Key clubs), potentially growing existing clubs and/or developing new clubs – especially as opportunities arise to extend Interact down to the middle school levels. Elevating knowledge and dispelling a few myths regarding what Rotary is and does. 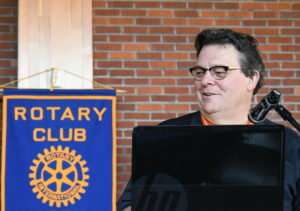 Complimenting/enhancing/growing District 5100’s existing “Speakers Bureau” serving area Rotary clubs. 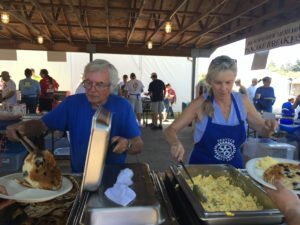 A little more cross-fertilization and collaboration among both Rotary clubs and other civic organizations with similar values and service to their immediate and broader communities. He also briefed us on the “Better Angels” initiative, a bipartisan citizens’ movement launched in 2016 to try to unify “red” and “blue” Americans. “‘Better Angels’ is building new ways to talk to one another, to participate together in public life and to influence the direction of the nation,” he said. For a copy of Dan’s presentation, email me at liondogfarm@msn.com. 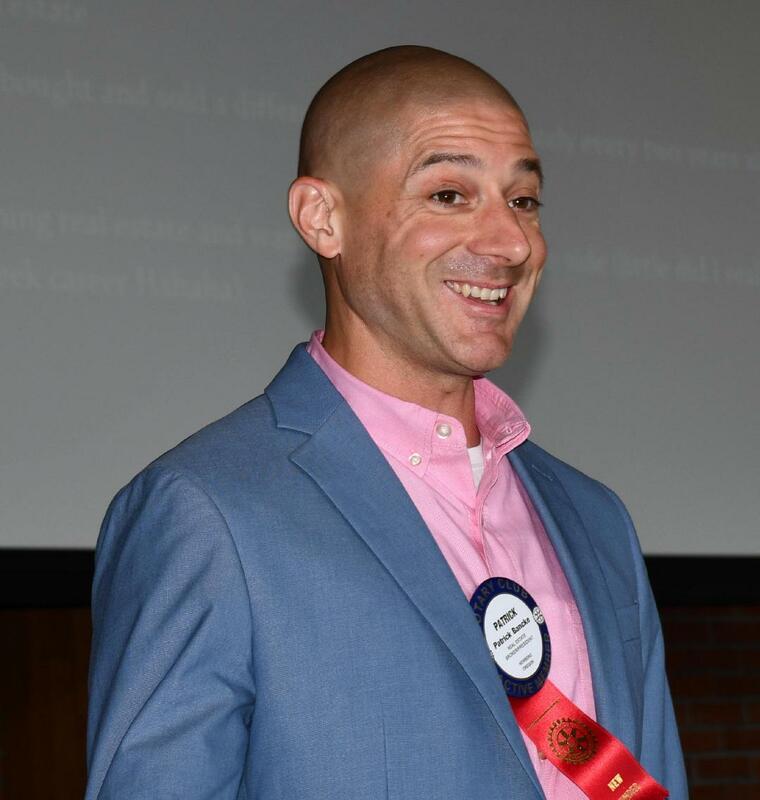 This just in — Congratulations are in order for Mike Caruso, who was honored as a recipient of Rotary International’s Distinguished Service Above Self Award at last weekend’s Rotary District 5100 Conference in Salem. The purpose of the award is to recognize individual Rotarians who have demonstrated exemplary humanitarian service, in any form and at any level, with emphasis on personal volunteer efforts and active involvement in helping others through Rotary. This is Rotary International’s highest honor for individual Rotarians. A maximum of 150 recipients world-wide may be selected each year. So well deserved, Mike! A Mass of Christian Burial will be offered for Club Past President Bill Dolan at St. Paul Catholic Church in St. Paul this Friday, May 25, 2018 at 11:00 a.m. A Celebration of Life reception will follow. Auggie Gonzales will miss this week’s meeting, as he is in Mexico for the wedding of his son Benjamin. Ben is a dentist and participates in our annual Guatemala dental mission. Walter Want reported his 15- year-old granddaughter has been accepted into an Olympics development program for soccer in Los Angeles. Walter also celebrated his 76th birthday by donating $76 to the Duck for Polio Plus! Don’t forget–May 31 is the deadline to submit applications for RYLA. If you know of someone who would be a good candidate, please contact Om Sukheenai or Aaron Lewis. 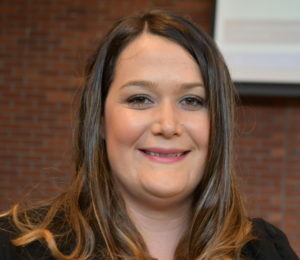 Shannon Buckmaster completed training and is now an official CASA advocate. One…two…cha cha cha. 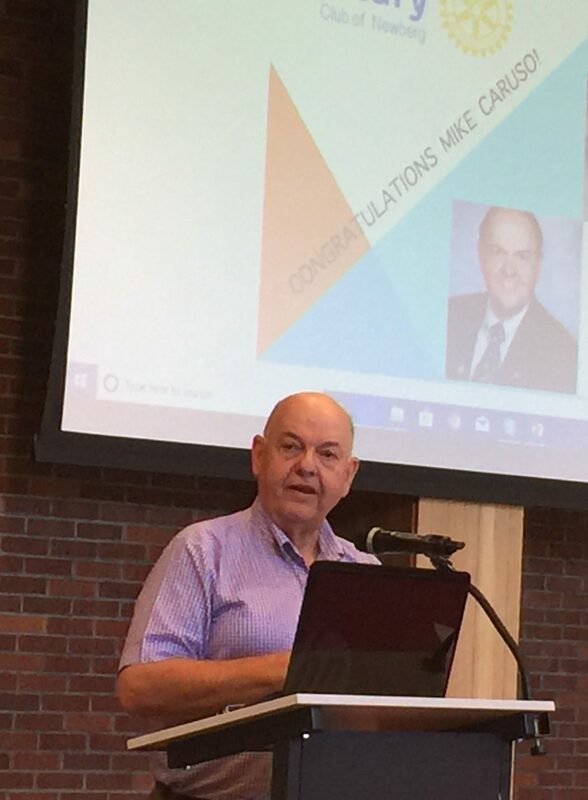 Dale Welcome says to be sure to mark your calendar for the June 13 meeting and to bring your spouse. The program will feature professional ballroom dance instructors who will help teach us some moves. Patrick grew up in a middle class family, but said there was “alcohol abuse” in the household. He started drinking at age 15, and it eventually created issues with getting into college. “I pursued a life of justice and equality, and at age 21 went into law enforcement.” He became a firearms instructor, suffered some injuries, and said he is now the proud owner of a new shoulder. With a wife, a child and a baby on the way, he realized he had to quit drinking. He decided there had to be something better, and “I found my faith in Christ,” he said. “I found I had a passion for real estate. I actually bought my first house at age 19, and was very blessed where I landed in real estate. I was led to a mentor” and life was good. And then came the August 2008 crash. Patrick said he now personally places a larger value on growing his business to help support local families through well-paying skills and jobs. 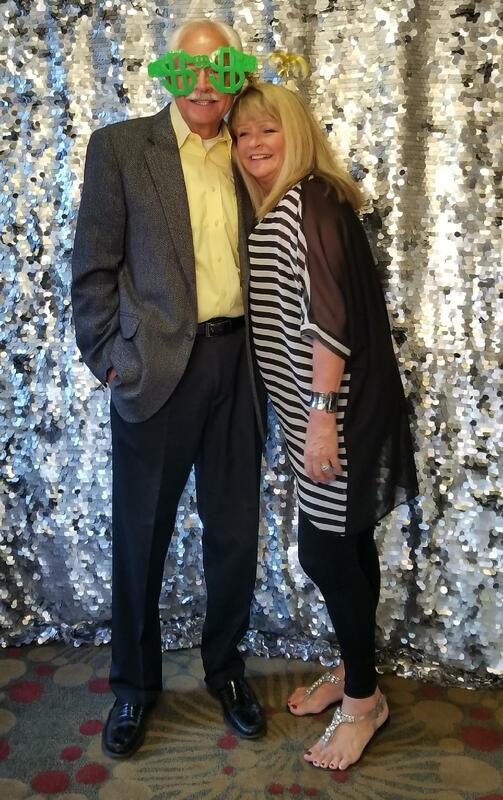 “Bill was diagnosed with an aggressive form of leukemia (Acute Myeloid Leukemia, AML) a week and a half ago. Unfortunately, we learned that he is not a candidate for feasible treatment. He has accepted his fate and is in fairly good spirits. At 88 years old he feels blessed to have had a long and successful life, which includes his involvement and friendships in Rotary. However, it’s doubtful that he will be able to attend any more meetings or Rotary activities. We enrolled Bill in hospice this afternoon, which will be a big help to his four children (three of whom work in St. Paul) and me. They will keep him as comfortable as possible and help us through the process of losing this loved person. I am just heartbroken! Our hearts go out to the entire Dolan family. At the meeting, Rotarians voted unanimously to establish the Bill Dolan Rotary Scholarship–an annual scholarship awarded to a St. Paul High School graduating senior who has also helped at the St. Paul Rodeo. Dave Parker, Scholarship Chair, met with the Scholarship Committee Friday and selected the scholarship recipient. 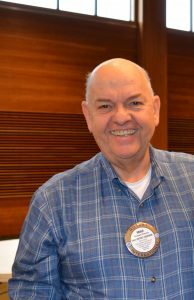 The first Bill Dolan Rotary Scholarship will be awarded during the St. Paul Awards Assembly scheduled later this month. 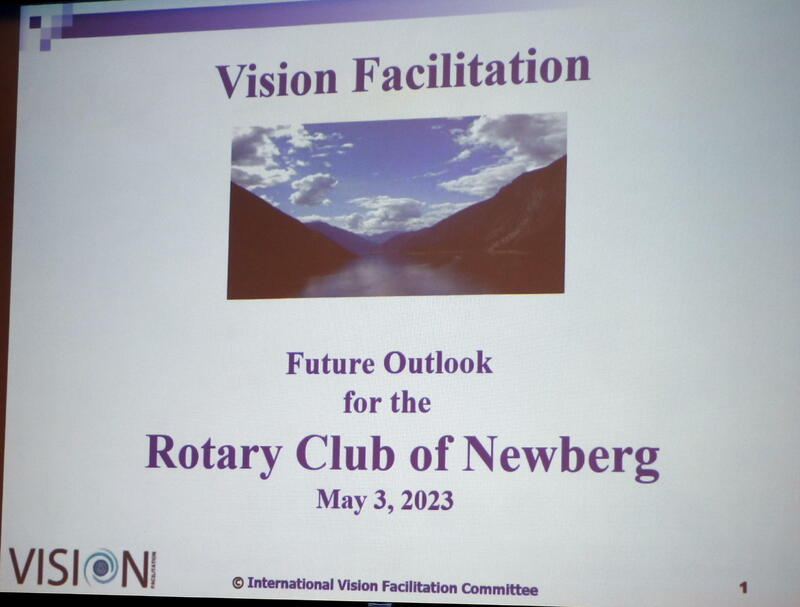 This spring Bill celebrates 30 years as a Rotarian in the Rotary Club of Newberg. Bill is Past President of our Rotary Club and Past President of the St. Paul Rodeo. Last week we met two of the four artists who are working on a concept for our club mural project. This week, Geoff Gilmore hosted the other two artists: Sierra Ratcliff and Annabelle Wombacher. She said she gets inspiration from books, and loves illustrating things from nature and things that matter to her. And she really enjoys doing large-scale pieces. Annabelle, right, really likes to draw insects. “A large body of my work is bugs,” she smiled. She gets inspiration from photos she has taken and especially likes beetles. She decided she wanted to be an artist her senior year in high school. She does a lot of drawing in ball point pen and pencil, and showed us some bees, a fly and a spider she had done. She has completed larger scale projects, including a 4-foot-tall drawing of an ant done in graphite. “I really enjoy taking something average or ordinary and making it beautiful,” she said. Kimberly Abraham, left, a mortgage specialist with Director’s Mortgage, attended our meeting for the first time as the guest of Shannon Buckmaster. Don’t forget–the District Conference is this coming weekend in Salem. Please go to the District 5100 website for more info and to register. Deborah Cathers-Seymour invited us to attend the grand opening of a new YOOP facility in McMinnville from 3 to 5pm on May 16. Please RSP to her if you are planning to attend. She also reported her daughter, Sky, has qualified to run the Boston Marathon later this year. 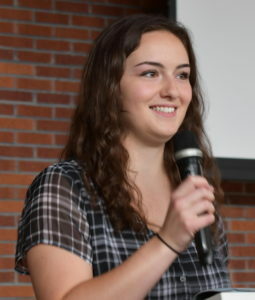 Corey Zielsdorf reported that his daughter has chosen the University of San Diego, where she has received an offer for a full scholarship, for her college experience. 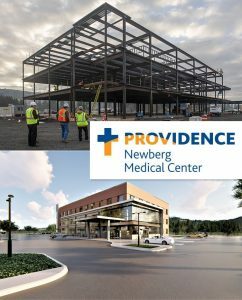 Terry Coss, Dan Sperling and Newberg Robotics are announcing a Newberg High School Machine Shop Open House on Tuesday, May 22, at 11:30am at Newberg High School. They will be showcasing the newly student-renovated Robotics Lab, Tiger Manufacturing partnership with A.R.E. Manufacturing and student projects in Mr. Coss’ CADD/CAM class. Cookies and coffee will be served, but please RSVP at www.newbergrobotics.org/open-house. A really fun-sounding fund raiser has been scheduled for Peace Village Global on Sunday, June 24. Come help support this organization, which teaches peace building skills to children around the world through camps, after-school and in-school programs. An all-female Merle Haggard Tribute Band called “Gerle Haggard” will play at the Mississippi Pizza Pub. The event is scheduled for 5 to 7 pm at 3552 N. Mississippi Ave. in Portland. Donations at the door. Dale Welcome introduces our speaker. 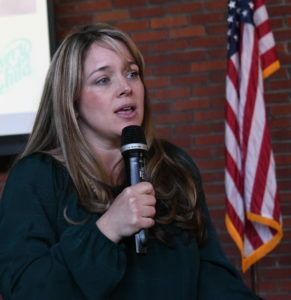 In introducing our speaker last week, Dale Welcome said Shelly Winterberg was a former co-worker and family friend, as well as the Director of Field Engagement for “Every Child,” an organization offering care and support to both foster children and the Oregon Department of Human Services (DHS). “Every Child” began in 2012 as “Embrace Oregon” in the Portland area. 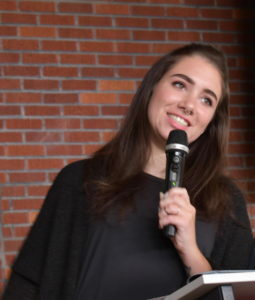 The first projects were preparing welcome boxes for children entering foster care and offering hospitality at the child welfare offices in the region. The welcome boxes were a huge hit, and offered the kids not only supplies, but a “You Are Special” message. Then, the organization began to look at DHS caseworkers as first responders. 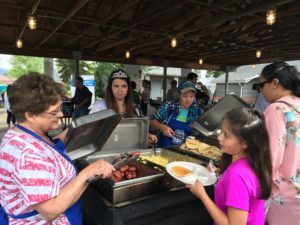 They looked for ways to support the workers, and started taking them cookies, hosting barbecues and doing other events to recognize their efforts. According to Shelly, “Every Child” is now at the end of the first year of a five-year program. It has expanded to 13 counties, and is now coming to Yamhill County. Overall, there are approximately 11,000 children in Oregon in the foster care system, and of those, 100 in Yamhill County. The DHS office in the county is in McMinnville. One project the organization is considering is the possible makeover of the office there. 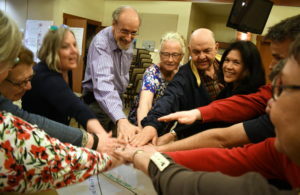 For more information, go to everychildoregon.org and fill out the “Connect” form. You can also like and follow the organization of Facebook and Instagram. Benjamin Cahoon discusses his background. Two of the four artists working on the concept for our club’s upcoming mural project were introduced by Geoff Gilmore. Benjamin Cahoon, from Florence, is a sophomore at George Fox University (GFU). He is a dual major in Studio Arts and Arts Administration, and works in a variety of mediums. He said he uses “natural, urban and spiritual themes.” His work has been displayed in the U.S. Capitol. Jared Mar is a junior at GFU. He was born and raised in San Francisco. “I grew up in an urban setting,” he said, so graffiti, tattoo and religious art were big influences on his “whimsical, fun and very messy” style. Jared said Rodin, Frank Stella and Vincent van Gogh are among the artists he really admires. The other two artists will be introduced at this week’s meeting. Geoff also announced the location for the mural. It will be highly visible on the side of the Steve’s Auto Body Shop building on Highway 99W. An application for a city permit is in process now. Shannon Buckmaster introduced Albert Eschler, who has decided to become a Rotarian. He is currently deciding between the EarlyBirds and our club. 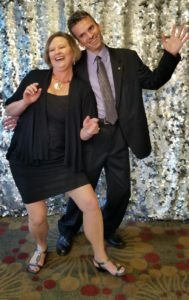 After all the prep work, lots of Rotarians let their hair down in the photo booth at the annual benefit auction April 28 at the Allison Hotel. 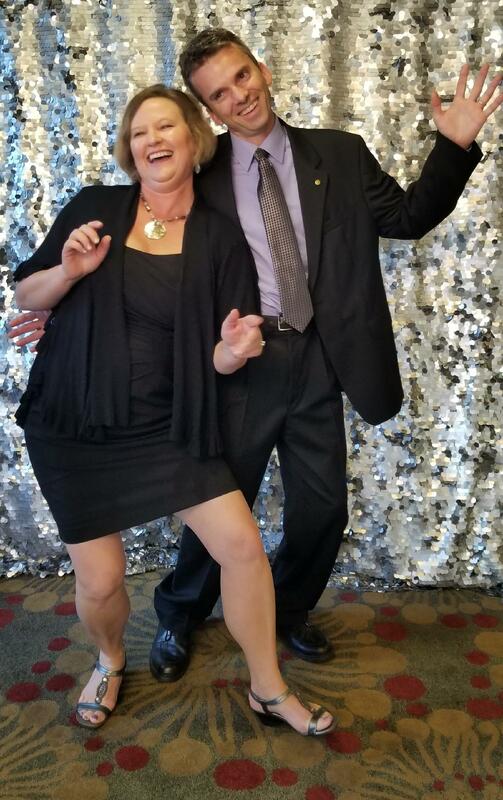 Corey Zielsdorf, left, and his wife, and Bob Ficker, right, and his wife were among those acting goofy for the camera. But not so fun, Auction Chair Denise Bacon is now recovering from pneumonia. Please feel better soon, Denise. Remember, May 31 is the deadline to get RYLA candidate applications to Aaron Lewis. Our District Conference is the weekend of May 18-20 at the Salem Convention Center. Still time to register on the District 5100 website. The Scholarship Committee, led by Dave Parker, is busy reviewing applications. Thanks to all, including Becky Ankeny, Marge O’Connell, Judy Robinson, Beth Pent, and Krissy Lookabill for the time they are donating to this project. 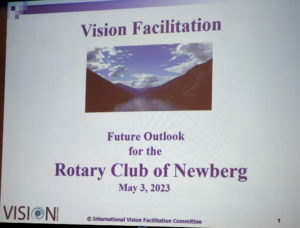 Last Thursday night’s Club Visioning session was well attended and generated lots of ideas for what our club should look like five years from now. Paula Radich sent out a summary, so be sure to look for that in your email. Here are some photos Auggie Gonzales took at the event. It’s been awhile since we had a Classification Talk as our meeting topic. This week, come to the Cultural Center to learn more about new member Patrick Bancke.